The University of Illinois at Urbana-Champaign is an example of a campus that moved swiftly. As soon as Phyllis M. Wise, the university’s chancellor, heard about Coursera from other administrators who had signed on, she wanted to follow suit. She asked the executive committee of the university’s Academic Senate for a recommendation on whether to work toward a Coursera deal, and a faculty task force quickly issued a report giving a green light for such a partnership. The task force devised a list of questions about how a Coursera partnership would work, said Nicholas C. Burbules, a former chair of the Academic Senate and a professor of educational-policy studies. For example, how would potential revenues from Coursera be divided within the university, and how would faculty members be compensated for teaching Coursera courses? From CHE, “Publishers See Online Mega-Courses as Opportunity to Sell Textbooks.” You get the idea from the headline. First off, this is at odds with the corporate MOOC movement’s public declarations of offering a free education for the world: textbooks are expensive. Second, and this is partly what I want to write more about later, it seems to me that MOOCs could be a replacement for textbooks, or at least a platform for them. A couple links via Stephen Downes. First, “The Coursera Gift Horse,” from Jonathan Becker’s blog “Educational Insanity.” Basically, he’s saying that there are some problems with Coursera, sure, but why are people complaining about this awesome and free resources? Of course, he’s just started this Social Network Analysis class, the one that Bill is taking too (more on that as I make my way through my links), so let’s see what he thinks in a couple weeks. If we begin talking about MOOCs as meritocracies, we are doubling down on the flawed ideology that got us into this mess. Sorta hard to be a movement that’s supposed to empower those who are disenfranchised from higher education and to be a movement of elites at the same time, isn’t it? Third, there’s mooc.ca, which is “a place to host MOOC news and information,” for all your MOOC-y overload needs. In the nutshell, this is for me the problem of Coursera and other models that are are trying to replicate/replace the way education works. For education to work, you’ve got to have some version of the diagram on the left. Education requires an instructor who coordinates what’s going to happen in a given experience (that is, creates the “syllabus” for a “class”), is the expert to whom students turn for a definitive answer (and in my view, this is true in educational settings that are “student-centered” and/or where knowledge is more epistemic, contextual, or contested), and is the person who determines if the student has learned what they were supposed to learn to get credit (assessing, grading, credentialing, etc.) 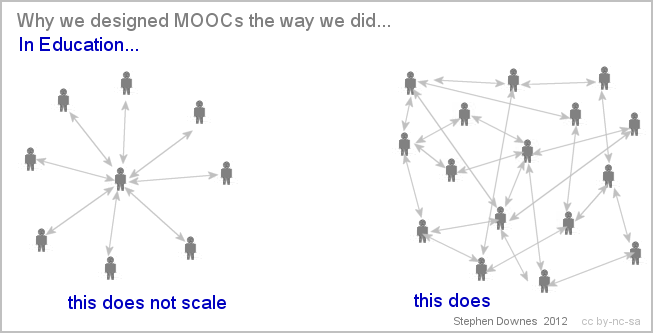 On the other hand, the “many to many” and scalable diagram on the right depicts learning, which can happen in lots of situations, including a MOOC. Elsevier, the academic publishing giant, announced on Tuesday that it will offer a free version of one of its textbooks this fall to students who register for Circuits & Electronics, a massive open online course (MOOC) being offered by edX. The publisher actually made available a free version of the textbook during the first iteration of that course last fall, with little fanfare. The results are in: Rather than prompting scores of traditional students in similar courses to pass on purchasing the textbook in favor of registering for the MOOC and freeloading, Elsevier found that providing a “static” digital version of the text for free to MOOC students actually galvanized sales elsewhere. Many many moons ago, when I was working on a textbook and the editing people were asking me what I thought would be innovative, I suggested to make a version of it available online for free and so they could recognize the “value added” of the actual book. They thought that was pretty funny. Also from IHE, “Gates, MOOCs, and Remediation.” Given the drop-out rate on MOOCs (which is all part of that meritocracy argument), I’d say this is not the role of MOOCs. But there is apparently some grant money tied to it, so I don’t know, maybe it’s worth checking out. The local “paper,” annarbor.com ran “Hundreds of thousands flock to free University of Michigan classes offered on web-based Coursera platform.” I have a comment in the discussion that people liked. And last but far FAR from least comes news that my friend and colleague Bill Hart-Davidson is going to be blogging about the Coursera MOOC he’s enrolled in, “Social Network Analysis.” Here’s his first entry; he’s apparently already getting into trouble. Next PostNext Five ways EdX can help “the little people:” you know, community colleges, etc.